Have you got big rocks or boulders in your yard? If your landscape vision starts with eliminating them, you may want to reconsider. A lot of times people look at boulders and think of ways to remove them from the property; however, they do have a lot of use for them when it comes to making your landscape look even better. After all, they are very natural. Not only that, but if you do not have your own boulders to use in your yard but you would like them, they are an inexpensive way to provide a little more for the landscape that you have. What qualifies as a boulder? Any large rock that is more than 10″ across can be counted as a boulder. It doesn’t matter how it looks or what type of rock it is, just as long as it measures over 10″. There are many boulders or large rocks can be incorporated into a landscaping scheme. No boulders of your own? Landscaping supply yards sell them by the ton, but they usually can be individually selected and paid for by weight. The denser the type of rock such as granite, the more it is going to cost. You can expect to pay a few hundred for the rocks depending on the type of rock that you choose to go with. Here’s where a professional landscaper can come in handy – your landscaper select stones which best fit with your overall landscape plan, plus they’ve got the equipment and manpower to move them. Erosion might be a concern in your yard if you have a grade change throughout the yard or a slope. 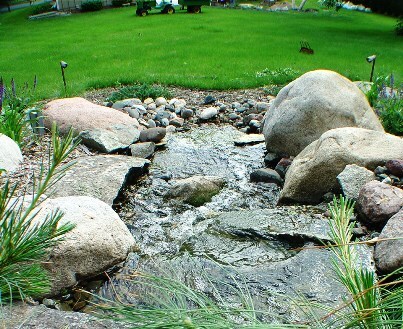 Boulders can then be used as a retaining wall for the yard to keep all of the soil and water in place. If it is on a hillside, this is even more useful since it can keep pets and children away from the side of the yard. Large stones on a slope are a natural waterfall element as well. Seating throughout a garden or yard is another way to use these very large rocks. Flatter top boulders work best for this type of landscaping technique. Accents throughout the landscape with boulders is a great way to add your own personal touch to the area. Depending on the type of rocks that you choose for the landscape, you might have a more rugged look to the area or you might be able to pull of a subtle, inviting environment. Boulders have a lot of creative potential. They can be grouped together to create new hiding spots and places to hang out. Children are able to climb on them and create fortresses. They’re perfect for natural towers and sculpture-like forms. They can be used in artful and creative ways that are tasteful to the surrounding landscape. Smaller boulders are useful for garden borders. It’s a good way to define the garden as well as keep mulch and soil in place. A camp-like atmosphere can be created in your backyard by strategically placing them in a circle to provide space for a campfire. The rocks will make a natural fire ring as they will contain your fire. If you want to find out more about using large rocks or any other type of stone in your landscaping, check out what Architectural Landscape Design can do for you and the landscape needs that you have.